“Real friends?” I said aloud. Right. In a month or so, I might have people who pretended to like me, who want to know me, but they would be a means to an end. “I wish I didn’t have it in me. But I look at Brittany, who held the camera, and I think, What would it take to break you? Would I have to mess up her face?” I couldn’t believe I was saying that, because it was so ugly, and it made me sick, that I could be this full of hate. I knew for the sake of my own mental health, I had to let it go. Ann Aguirre's Razorland Trilogy had me hooked from the first chapter of the first book. With Mortal Danger I found that I was a little harder to sell on it. 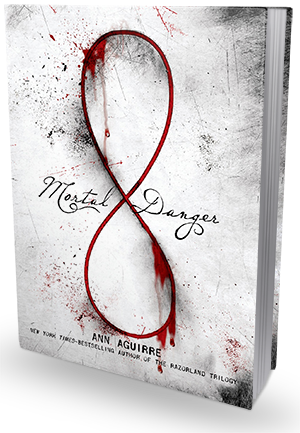 This is the type of book that will take you to dark places and make you see that sometimes what you get isn’t always what you want to give.With darker tones to it and some things that will not be for everyone, Mortal Danger was nothing like what I had expected and yet is was Aguirre’s amazing writing. This book had a dark edge to it within the plot that I really liked. In order for an intervention to be made the person had to be on the edge of leaving everything behind, taking their own life. I’m not saying that I like the idea of people ever feeling the need to do that, just that there was something on the edge of the scene ready to intervene. The plot was unique to me in that sense, and also as it did not make anything out to be angels or demons. It was simply something that stepped in and was not to be further discussed. However, my problem lay in the fact that I felt that the book took so long to really take off. I feel that the slow start may be a bit of a hurtle for many, but once over it the book is amazing.hat the book did take a bit to actually get going. The pacing was slow to start and it was close to midway before everything really started to get going for me. Edie was interesting. She was far from perfect, but there was a little something that I liked about her. There is both intrigue and disappointment with her. I am saddened by the fact that she had to change herself on the outside to be accepted. I get that society does this and that her classmates drove her past her breaking point, but part of me wished her the strength to rise above it all. However, with that being said I was curious about how she would deliver her revenge and how she would feel about it. We all want that satisfaction of making those that hurt us feel the same way… Until it happens. I wanted to know if once she became a part of their world if she could deliver what they had. The romance was not really romance. The connection that sparked between Kian was fragile and developed quickly. I don’t want to say it was instantly love but it was like he was the one she couldn't forget right away. Admittedly he is beautiful and perfect but she didn’t know much about him. Being honest I wasn’t even sure what I thought of him to start. There really wasn’t much on him, beyond he offered Edie the deal and seemed to care, or not care. Yes, it took me a bit to warm up to him as a character, but he did come around and I really ended up liking who he became with Edie. This is a far cry from the Razorland trilogy that I fell in love with, but it has shown some serious potential that I hope will develop. There was definitely a touch of dark and I am still curious to find out who the big players behind the wishes really are. Admittedly I would also like to see Edie grow in her inner strength and maybe see Kian develop a little more as a character. I feel that there is a lot of potential for this series. Pick it up if you can handle a little bit of a slower start, but want a begging for more finish.